The redesigned Dusky 16 brings a new level of performance, price, utility, and comfort to the Dusky boat lineup. Dusky 16R handles with ease and is remarkably stable, both anchored or underway. Whether you require an easy to maintain basic skiff or a fishing and diving boat that gets you where you want to go; the Dusky 16R can be rigged to suit your requirements from her extensive options list. Built with the same rugged integrity as all of our offshore boat and inshore boat models, Dusky 16R offers unrivaled stability for a multitude of uses. The original DUSKY has been brought back. Dusky 17R is the perfect choice for fishing, skiing or adventures in shallow water. Her shallow draft hull and 8 degrees of deadrise at the transom make her ideal for both bay and flats use. Dusky 17R is equipped with the Dusky Drive; a unique fiberglass outboard bracket with integrated swim/dive platform. The Dusky Drive improves maneuverability and stability to your boat while allowing a full transom for safety. When you purchase a new boat from the manufacturer, she's priced right for the first time boater and has an extensive options list to let you configure her to your needs. Best of all, she's a Dusky hull, which means she’s built with the same strength and rugged integrity as all of our offshore boat and inshore boat models. A wide variety of powerplants (including Suzuki and Evinrude) lets you get the performance you need at a price you can afford. Built with the same rugged integrity as all of our offshore boat and inshore boat models, Dusky 17RL is a hybrid boat featuring both a rolled edge and a liner. Dusky 17RL handles with ease and is remarkably stable, both anchored or underway. 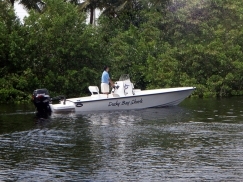 Dusky 17 RL is equipped with the Dusky Drive; a unique fiberglass outboard bracket with integrated swim/dive platform. The Dusky Drive improves maneuverability and stability to your boat while allowing a full transom for safety. She's priced right for the first time boater and has an extensive options list to let you configure her to your needs. Unlike other shallow water boats, the Dusky 18 flats boat’s hull was designed for the rough waters encountered enroute to the flats as well as near-shore ocean fishing. 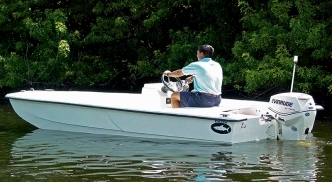 The Dusky 18 flats boat’s totally flush non-skid deck allows unobstructed fishing, bow to stern. With standard features like under-gunnel rod holders, 25 gallon oval livewell and large dry storage compartments; this boat organizes cargo with ease. She provides a smooth, dry ride whatever your needs are. Our FACTORY DIRECT and extensive options list allows you to outfit her exactly as you require without breaking the bank. Best of all, the Dusky 18 Flats boat is built with the same strength rugged integrity as all of our offshore boat and inshore boat models. Unlike other shallow water boats, the Dusky 18R Bay's hull was designed for the rough waters encountered enroute to the flats as well as near-shore ocean fishing. The 18R Bay boasts high performance for a shallow water boat. 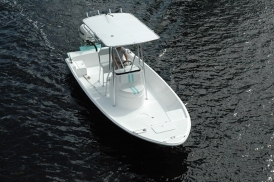 The Dusky 18R Bay's totally flush non-skid deck allows unobstructed fishing, bow to stern. She provides a smooth, dry ride whatever your needs are. Our FACTORY DIRECT and extensive options list allows you to outfit her exactly as you require without breaking the bank. Best of all, the Dusky 18R Bay is built with the same strength rugged integrity as all of our offshore boat and inshore boat models. A new level of performance is now at your command with the advanced design of the Dusky 18R flats boat hull. Her razor sharp entry provides unsurpassed rough-water handling. Superior weight reductions let you power your boat with less horsepower than conventional flats boats while still realizing amazing performance numbers. Less motor equals less weight and less fuel expenditure. That means lower running costs for you. Her wide stance makes her amazingly stable at rest and her chine line keeps everyone dry when on the go. Built around an all-composite structure, the Dusky 18R flats boat is a sub-1000 pound hull with one of the most spacious and customizable deck layouts available today. When you buy a boat from the factory, you can set your vessel up the way you want to. Her totally flush non-skid deck allows for 180 degrees of unobstructed fishing. Customize the 18R flats boat to suit your fishing requirements; from more storage to multiple bait tank configurations to poling platforms. We build to your order. You bought a flats boat, so why do the payments feel like you purchased another house? Forget astronomical pricing from dealerships, Dusky 18R is a complete shallow water boat at FACTORY DIRECT. Why spend twice or even three times as much for another boat that won't do the job half as well? Dusky 18R is the new equation in flats boat fishing. 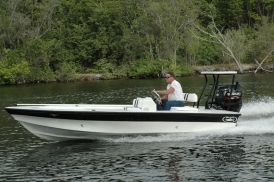 The Dusky 218 RL is built with the same strength rugged integrity as all of our offshore boat and inshore boat models. Her sleek lines afford ease of entry and a comfortable ride. 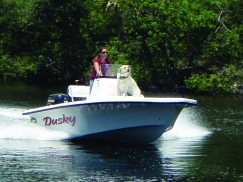 Dusky 218 RL is equipped with the Dusky Drive; a unique fiberglass outboard bracket with integrated swim/dive platform. The Dusky Drive improves maneuverability and stability to your boat while allowing a full transom for safety. Need to custom rig your 218 RL? Our options list lets you outfit her exactly as your require. Our FACTORY DIRECT pricing gives you a lot of boat for a lot less money. Available with a wide variety of powerplants, including Suzuki and Evinrude. The Dusky 242 Bay features an overall length of 24’ 2” and a beam of 7’ 8”. The front casting platform is both spacious and stable while the stern area offers plenty of room to maneuver while fishing. The versatile Dusky 242 Bay has been designed to handle the bay waters while still being offshore friendly, making her a dry runing, sea-worthy craft.